We are adjacent to the lever bridge, opposite the Bassin Louise. 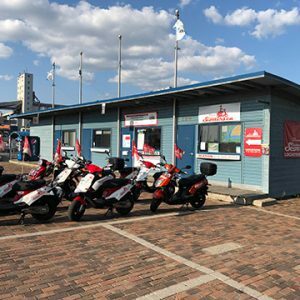 Our scooters are available for hourly rental or daily rental. Please also note that in daily rental we offer special group rates. The more scooters you rent, the more you save. How many scooters would you like to rent? In daily rental we offer special group rates. The more scooters you rent, the more you save. How long do you want to rent your scooter? You can rent your scooter for a time range of 1 hours or 3 hours. We even allow you to bring your scooter back after hours. Also enjoy special rates for evening rentals.